My mama learned this chicken curry recipe from Christine and Fernando, our Portuguese-Indian neighbors, on the Lower East Side, in the 60’s. When she first tasted it, she had no palette for spicy food and sweated her way through the meal. Once she got used to it, she loved this dish and we loved it too. She used to swear by the A&P’s curry powder to make it. The Portguese neighbors put the entire container in the curry,When they A&P closed, I thought we’d never see the curry again. 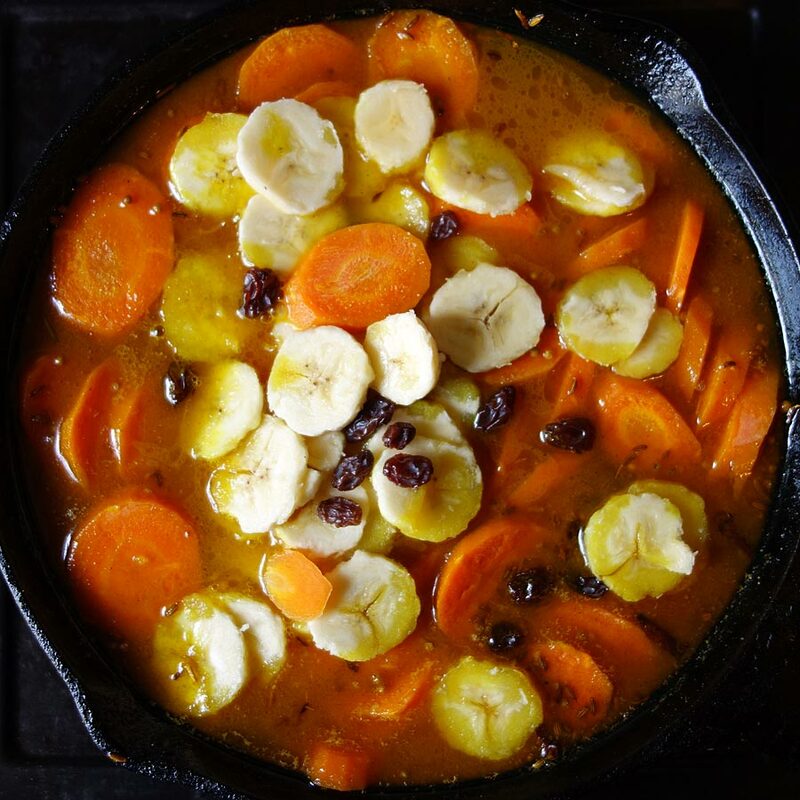 Over time we discovered great Madras curry powders from the Indian shops in Curry Hill along Lexington Avenue and on the Lower East Side that are perfect in this dish. You’ll find it’s dead easy to whip up and a real crowd pleaser. I recently found the original recipe, that had fallen out of a recipe notebook many years ago. 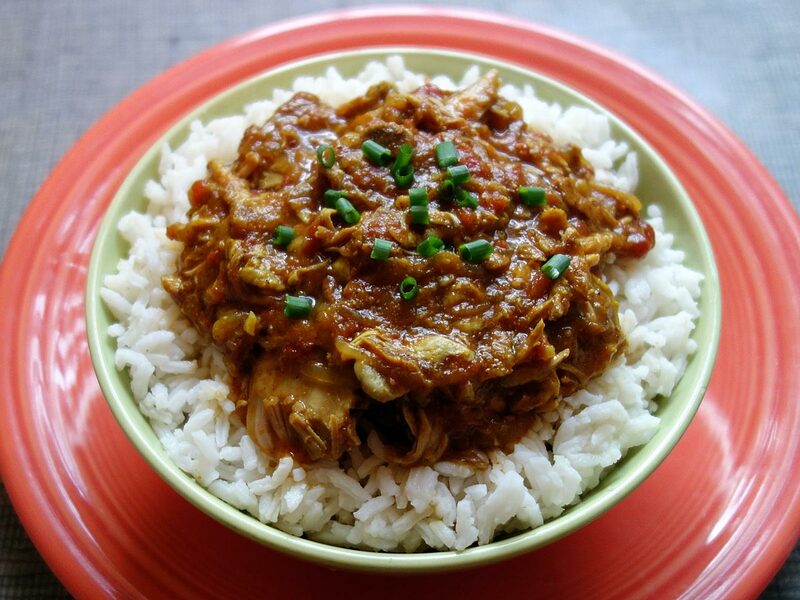 It calls for cooking this chicken curry in a pressure cooker. I have a very distinct not-so-fond memory of the pressure cooker exploding in our Brooklyn kitchen when I was eight years old. I think it was a pot of black beans and they were all over the ceiling—no one was injured. I developed a healthy fear of pressure cookers after that. I’ve recently come around and requested and received a 23 quart pressure canner-cooker for my birthday. I can’t wait to try this recipe in it. You can flesh the dish out by adding potatoes, carrots or other veggies. I like to keep it simple and cook other Indian veggie dishes to go with it. That way you have all sorts of contrasting flavors playing ping pong with your taste buds..
For a dinner party, I made the chicken curry and served: Cauliflower, Okra and Coriander Balti, Lentil Dal, Green Apple, Cucumber and Scallion Raita, Carrot-Banana Curry and Steamed Asparagus and Snow Peas. I served it with lime pickle, mango chutney, my green tomato, green apple and green chili chutney, chopped fresh coriander, chopped fresh chilies and pappadums. The cool thing about cooking Indian food is predominatesly stewed food. The preparation is fairly simple as long as you can source the ingredients.